Under Armour tactical performance apparel keeps you cool when things get hot. The Armourblock® technology of this shirt neutralizes the microbes that cause odor before there's any odor at all. The result: moisture transport with maximum scent suppression. For when it's hot. Keeping athletes cool, dry, and light. Ideal use: Extremely warm weather. Over a decade ago, Under Armour HeatGear®, the original second skin layer, sparked the revolution of performance apparel and rendered cotton T-shirts obsolete. Warning! This product is not flame-retardant, never use this Under Armour shirt as a substitute for flame-retardant or ballistic protective equipment; Do not wear it when exposed to extreme radiant heat or open flames; Under Armour shirts that are not flame-retardant may melt in extreme heat that exceeds 350 Deg - Exposure of the skin to fire or flame can cause injury . You'll never wear a non-performance T-shirt again. Featuring the Under Armour signature moisture transport and compression fit to keep you cool, dry, and comfortable. Under Armour ArmourBlock® technology eliminates odor causing microbes. 81% 4.5 oz PolyArmour® / 19% Elastane. Great work out shirt drys quick. Good fit and good feel. Forget that I amm wearing it. A great and comfortable shirt. No logo on the chest to worry about. 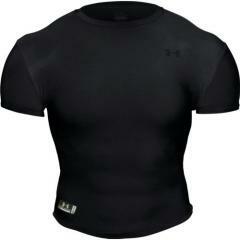 Just keep in mind that it is a compression shirt, so get the next size up from what you would normally wear. Although I have a little mans syndrome I ordered a medium and definitely should have gotten a large. Fits great feels great. Excellent buy. Provides excellent support and compression all day long. Fits exactly the way it is supposed to. Even though it is supposed to fit tight, you do not feel the restriction against your skin. Fits great and keeps me cool. Great for wearing under a vest. Collar holds its shape.